Home Tags Posts tagged with "blue ivy bedroom"
Beyonce’s VIP hospital suite, where baby Blue Ivy Carter came into the world, looks like the penthouse in a five-star hotel, having four flat-screen TVs, a kitchenette and posh furniture. 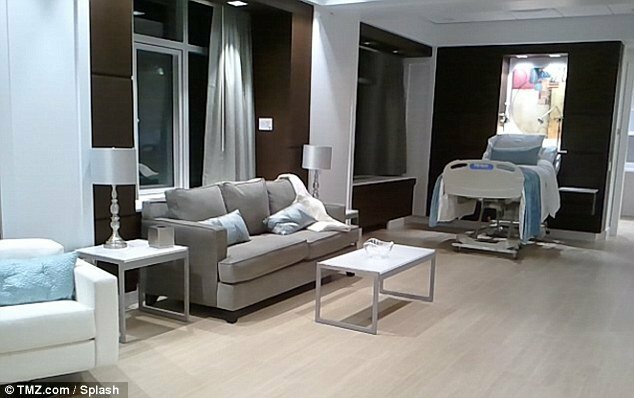 Exclusive images of the luxury New York hospital room which is reportedly where Beyoncé gave birth to her first child with rapper Jay Z have just emerged via showbiz news website TMZ.com . Apparently the newly constructed VIP suite at Lenox Hill Hospital in New York wasn’t built especially for Beyonce and Jay-Z- contrary to previous reports that alleged the couple paid to have the area customized for their use. The posh interior includes a living room area complete with a plush cream, three-piece suite, a coffee table and matching lamp. The room also features a kitchenette with a sink, a microwave and a shelf-full of coffee cups, meaning that the singer and her family could make themselves quick hot snacks. There is also a single bed especially for the father-to-be or another family member to rest while waiting for the baby to arrive. Like everything else connected with the birth of baby Blue Ivy Carter, this is yet more proof that the birth of the hip-hop princess was a lavish affair. Earlier this week Blue Ivy was spirited out of the hospital in a customized Mercedes van. Beyonce, Jay-Z and baby Blue Ivy were said to have been followed by a cavalcade of cars through the darkness. Beyonce bought the van a couple of months ago, apparently in readiness for the birth, swapping her luxurious Maybach for the souped up motor. In true superstar style the 30-year-old has pimped her ride to the max and spent a whopping $1 million kitting out the Mercedes vehicle. It has an engine big enough to power a large lorry – but has the soft drive of a limousine. Beyonce requested hand stitched Italian leather seats be installed in cream with chestnut lining. To make sure she doesn’t ever have to stop at a service station Beyoncé has a full bathroom with a shower, sink and toilet. No doubt the couple was being transported to their luxurious Tribeca penthouse apartment in New York so they could settle into her new home. Beyonce has had a luxury nursery built which includes a $20,000 cot as its centrepiece. The Posh Tots Carriage Fantasy Crib is made of solid cedar and birch and comes complete with a rear luggage rack which doubles as a changing table. Their departure from hospital – following Saturday’s birth – comes as it had emerged that the A-list couple allegedly infuriated other new parents by enforcing a lockdown at the hospital where they had their first child together. They also had their own private security force working an area alongside hospital security already at Lenox Hill Hospital. The extraordinary lengths for privacy led to other parents bitterly complaining that the intense measures had made other new parents miss out on precious moments with their own newborns.